December 2005 S/m's Dan Church L.M. , Eric Hirst L.M , and Bob King discuss feasibility of forming a branch at the eastern end of the island because of the traveling distances and time being excessive. January 2006 Local recruiting campaign to see if there is any interest, held in local tavern. Decision taken to apply to RNA HQ to form another branch. 16th February 2006 S/m Eric Hirst L.M. reads out statement of intent to the Cyprus Branch members, not received very graciously. ** Unfortunately S/m Dan Church L.M. had to return suddenly to the UK for family reasons and was replaced by S/m Roy McKeon Full Member. May 2006 - Jan 2007 Preparations begin for commissioning ceremony to be held at The Officers Club Dhekelia, on the 7th February 2007. 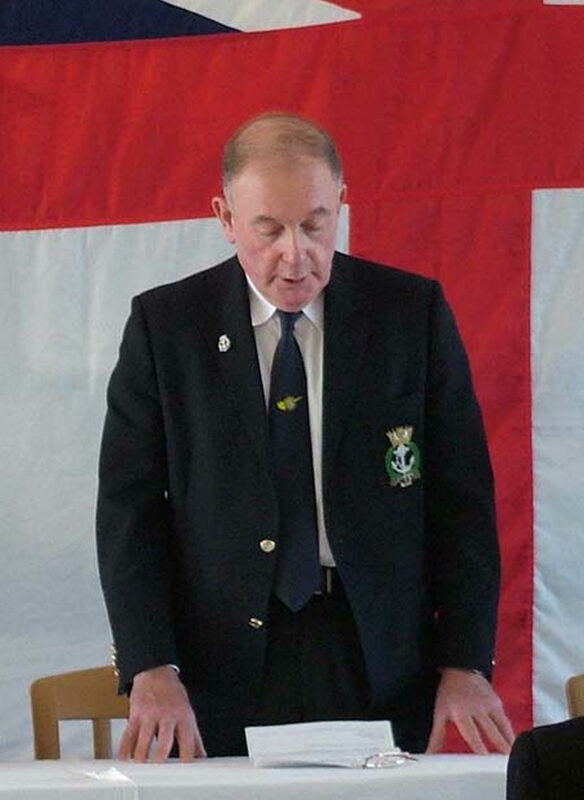 Ceremony to be carried out by RNA National President, S/m Vice-Admiral J (John) H.S. McAnally CB LVO RN. 7th February 2007 Commissioning Day: Admiral John McAnally CB LVO RN carries out the Commissioning Ceremony in front of invited guests. After ceremony and welcoming speeches a finger buffet was served. A social evening was then held at the club. One of the RN Cyprus Squadron's patrol boats, HMS Dasher, patrolled the bay and anchored just off The Officers Club beach. 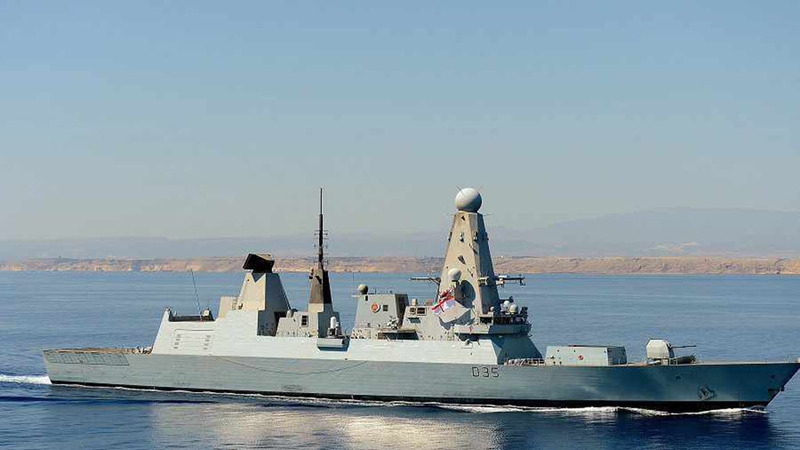 HMS Dasher departed for Akrotiri at sunset. Air Vice Marshall Richard Lacey RAF,- Commander British Forces Cyprus and Mrs Kate Lacey. Sir Edward Du Cann - Former MP and Privy Councilor, President Cyprus Branch RNA. Lt. Cdr Alex Bush RN - Commanding Officer Cyprus Squadron. S/m Alan Robinson - RNA National Ceremonial Officer. S/m 'Nobby' Hall - Chairman Cyprus Branch RNA and Branch Members. Lt Dan Todd RN - O/C RN Unit JSSU (Cyprus) Ayios Nikolaos and Mrs Todd . Wing Cdr Jim Beveridge MBE and Mrs Beveridge. Paul and Mrs Tarrant - Secretary RAFA Aphrodite. Mr Adam Gardiner - RAFA Aphodite, Welfare Officer and Mrs Gardiner. Mr and Mrs Keith Wilkinson - Representative of The Royal British Legion in Larnaca. 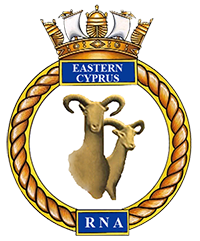 Families and friends of the Eastern Cyprus Branch of the RNA. Mr and Mrs Bob Lindsey - Managing Director Orca Consultants Ltd, supporters of the Branch. 2007- 2008 Buying and dedication of the Branch Standard from the time of the commissioning through to 2008, the Branch worked hard towards getting their own Branch Standard. January 2008 S/m Eric Hirst wrote to several manufacturers of standards to get quotes. It was decided that Newton Newton, Flag and Banner Makers, Lincolnshire would be offered the commission. July 2008 Standard and accessories collected from manufacturers by hand and brought out to Cyprus. September 2008 Invitations sent out to Commanding Officer JSSU (Cyprus) Lt. Col. Mike Dooley Royal Signals and Mrs Dooley, and WO1 (RSM) Sean Fleming. Invitations also sent to RAFA Mr Adam Gardiner and Mrs Gardiner, Scout Association Mr Ivor Demain and Mrs Demain, Mr Bob Lindsey, Managing Director Orca Consultants Ltd - Financial supporter of Branch, and Mrs Lindsey. Lt. Cdr. Paul Chambers RN, CO RN Unit JSSU (Cyprus), The Royal Military Police Association, Richard Bardsley Chairman REA Cyprus, Chairman Cyprus Branch RNA. All those invited who had Standards were invited to parade them. 12th October 2008 The undedicated standard was borne into church by the Branch Standard Bearer, WO (CT) Si Joyce who was escorted by S/m Peter Lightowler and S/m 'Beebs' Beeby (RNALO) accompanied by five other standards from the RAFA, RNA Cyprus Branch, RMPA, REA, Scouts Association. The ceremony was carried out with all due solemnity by Revd Freeman. A buffet reception was well attended in the mess afterwards. RNA National President, S/m Vice-Admiral J (John) H.S. McAnally CB LVO RN. carries out the Commissioning Ceremony in front of invited guests.